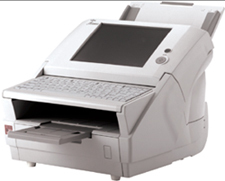 The easy-to-use network scanner for sharing documents in MODEL fi-6000NS today's multi-location, global environment. The Fujitsu fi-6000NS Network Scanner is the first network scanner that combines the intuitive, easy installation of a desktop scanner with the productivity of a network scanner. Network sharing, log into network, emailing and faxing just got a lot easier. Simply load your documents, determine settings and press the start icon on the touch-screen. The fi-6000NS network scanner scans in color, grayscale and monochrome at duplex speeds up to 50 ipm. And with a 600 dpi optical resolution, image quality is among the best in its class.